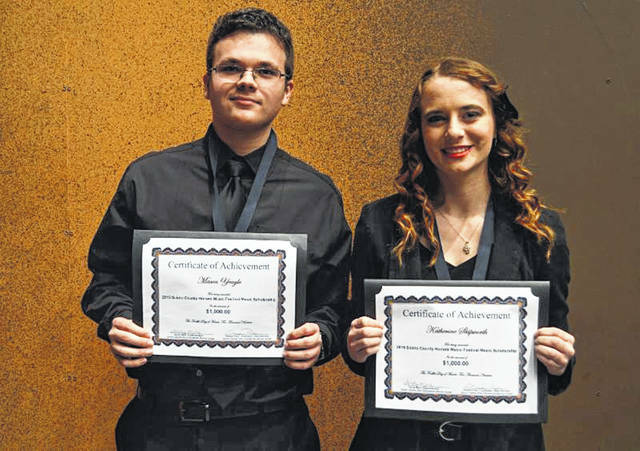 Two students were each awarded $1,000 music scholarships in front of a packed house during the 77th Annual Scioto County Honors Music Festival at the Vern Riffe Center for the Arts, at Shawnee State University in Portsmouth, Ohio, on March 12. Mason Yeagle, from Minford High School, plans to study music at Morehead State University and has participated in the Scioto County Honors Music Festival every year since the 7th grade. He has also participated in Morehead State University’s Summer Arts Academy, Ohio University’s Honors Flute choir, Phantom Regiment Drum Major Camp and as a musician in a number of musicals. He was also chosen to be Field Commander of the Minford Marching Band his junior year. Mason’s high school band director is Adam Porter. Katherine Skipworth, from Green High School, plans to study music at Marshall University. Katherine is passionate about music and music theatre. She has participated in high school choir, high school band, church choir and community theatre. Katherine has served for the past two years as the Field Commander for the Green High School Marching Band. She volunteers her musical talents in the community quite often and has won the annual “Green’s Got Talent” Contest for the past four years. Katherine’s high school band and choir director is Matt Chaffins. Close to 200 local music students in grades 7-12 from Clay, East, Green, Minford, New Boston, Northwest, Oak Hill, Portsmouth, South Webster, Valley, West and Wheelersburg performed in the music festival this year. Guest Conductors for the concert included Brent Hunt directing the Junior High Honors Band; Dr. Otis French directing the High School Honors Band and Dr. David Castleberry directing the High School Honors Chorus. “The guest conductors were very complimentary of our students and the quality of the music education programs in this county. They were impressed by both the students and the band and choir teachers involved in the Honors Music Festival,” said South Central Ohio ESC Gifted Services Coordinator Sharee Price. Sponsors for the Music Festival included: The Scioto Foundation, GE Aviation/ Peebles Test Operation, Portsmouth Rotary Club, Richard D. Marting Foundation, Shawnee State University Community Grant, Southern Ohio Medical Center, William and Barbara Burke, DESCO Federal Credit Union, Roalee Greene, Dr. Michael Martin, Portsmouth Area Arts Council, StaBO Construction Limited and Dr. Wayne and Mrs. Saundra Wheeler.